Feast of the Assumption of Our Lady, August 15th. The Catholic feast of the Assumption is celebrated on Aug. 15, and Eastern Orthodox and Eastern Catholics celebrate the Dormition of the Theotokos (the falling asleep of the Mother of God) on or around the same date. Mary was with the disciples in the Upper Room, waiting for and praying for the Promised Holy Spirit. From the earliest days of the church, Mary was spoken of in the Christian community as the ‘Second Eve’, the ‘Mother of all the living’. Jesus Christ was spoken of as the Second Adam… undoing what the first Adam had done: Mary, helping in that work, ‘crushing the head of Satan’ with her heel. This, even from the first century after Christ. Blessed John Henry Newman wrote of her holiness and her dignity being spoken of from the very start. Her Assumption was celebrated in different churches from around the year 400. ‘Our tainted nature’s solitary boast’. William Wordsworth. From Benedict XVI: “By contemplating Mary in heavenly glory, we understand that the earth is not the definitive homeland for us either, and that if we live with our gaze fixed on eternal goods we will one day share in this same glory and the earth will become more beautiful. Consequently, we must not lose our serenity and peace even amid the thousands of daily difficulties. The luminous sign of Our Lady taken up into Heaven shines out even more brightly when sad shadows of suffering and violence seem to loom on the horizon. If you neglect Mary, you neglect her son. She is Theotokos. He is the Son of God, and the Son of Mary. To neglect her is to neglect the mystery and wonder of the Incarnation, Word made flesh, dwelling among us in time and place. The purpose of our Icons: icons are written, to teach the truths of faith. 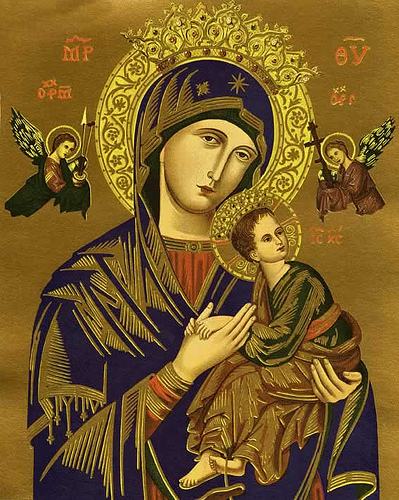 Mary is presented as Meter Theou, or Theotokos, Mother of God, the Bearer of God. She is Mother of her Son, and of all who make up the body of her Son. She holds us all in her embrace and watches over us with care and love. She is always Mother, always running to catch us as we fall,- the one who is always running, -Mater de perpetuo succursu. Queen of the Angels and Queen of this day. ← Reflection, 19th Sunday of Ordinary Time, August 12, 2012.